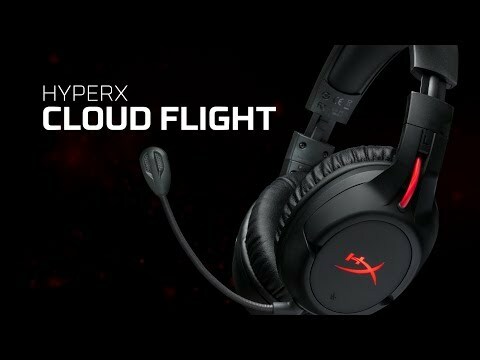 ESCAPE THE HOLD OF CABLE CONNECTIONS Featuring a solid, gaming-grade wireless connection, up to an incredible 30 hours of battery life and unmatched HyperX comfort, the Cloud Flight™ is an innovative gaming headset that allows you to play uninterrupted for longer. Easily monitor battery life and adjust mic and output volume with the HyperX NGenuity software. The closed-cup design of this wireless headset keeps you fully immersed in your gameplay, while the durable steel slider and high-quality construction mean your headset is built to withstand daily wear and tear. This PC, PS4™ and PS4™ Pro ready headset is also compatible with devices that support a 3.5 wired audio connection via the included cable, meaning the versatility of your Cloud Flight™ doesn't stop at wireless. The ear cups rotate 90° to rest comfortably around your neck during breaks, and the convenient controls for LED effects, mic mute, power and volume are located on the cups. The Cloud Flight™ comes with a detachable noise-cancelling mic that guarantees crystal-clear communication, and the headset has been certified by TeamSpeak and Discord so you know you can use it anywhere. THE HEADSET WITH ERGONOMICS IN MIND Remain comfortable even during long, late-night gaming sessions thanks to the Cloud Flights memory-foam ear cushions which adapt to your shape to make for superior comfort. Along with the durable steel slider that you can adjust at any time to keep the headset in a comfortable place on your head and also around your neck with the cups being able to rotate 90°. HYPERX UNBEATABLE BATTERY LIFE The Cloud Flight™ wireless PC gaming headset uses a USB connector to provide you with a solid wireless connection at all times, and is fortified by a battery life that works for up to 30 hours, allowing you to consistently play your favorite video games without having to stop for a recharge. FIND THE PERFECT ATMOSPHERE IN YOUR GAMES The HyperX gaming headphones provide you with crystal-clear lows, mids and highs to help enhance the ambiance of your games. Discover true immersion and easily pinpoint your enemies with the Cloud Flights high-quality audio, and always stay at the top of your game. CONVENIENT EAR CUP AUDIO & MIC CONTROLS Quickly access the controls for the Cloud Flight™ gaming headset for LED effects, mic mute, volume and power on the ear cups. DETACHABLE NOISE-CANCELLING MIC The HyperX Cloud Flight™ comes with a detachable noise-cancelling microphone that allows you to plug in and instantly communicate with your team to rise above the rest during games, or detach to relax with music. COMPATIBLE WITH BOTH PC AND CONSOLES This intuitive wireless headset for your PC and PS4 gaming needs. Cloud Flight™ is also headphone compatible with devices that support a 3.5mm connection via the included cable. HYPERX NGENUITY SOFTWARE Monitor battery life and adjust mic and output volume on your HyperX Cloud Flight™ with the easy-to-use software. You can also use the NGenuity software to customize RGB on your other HyperX devices. 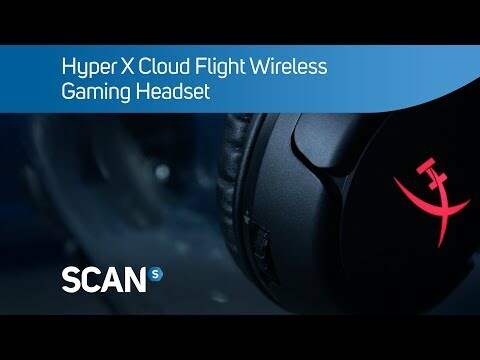 HyperX Cloud Flight Wireless/Wired Stereo Gaming Headset, 50mm Drivers, LED Lighting, USB RF 2.4GHz/3.5mm, for PC/PS4 is rated 5.0 out of 5 by 3. Rated 5 out of 5 by jemlin from Excellent Sound Quality - Decent Enough Build Quality If you've ever used any other HyperX headset this will feel and sound very similar. The construction is all plastic but high quality plastic atleast. No creaks or weird noises. Headset is light and very comfortable to wear for extended periods. Ear cups are a little small and if you find yourself getting sweaty during extended listening sessions then these probably aren't the headphonse for you, Logitech's line tends to have more room in the cans and therefore build up less heat. For your money though, this is the best set of headphones you can buy. Rated 5 out of 5 by drbarnes82 from Excellent Wireless Headset This thing is amazing. Incredibly comfortable and the sound is top notch, not just for wireless but just for a headset in general. I can easily wear these things all night without getting any ear fatigue at all. The range is great, my PC is downstairs and I went upstairs to check on the kids and they worked perfectly with no drop in quality even. The microphone is pretty good too, obviously not the best but perfectly acceptable quality. I'm so happy they didn't try to implement any of that wonky 7.1 virtual rubbish so many others try. It never works, sounds terrible and the fact they stuck to stereo only is a great move in my opinion. The sound stage is pretty good for a closed design too and for me I can easily pick out enemies footsteps and the direction no problem.